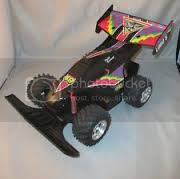 Does anybody have any information about a Nikko Lobo 5 RC car? I picked one up for $5, but it is missing the battery and control transmitter. My plan was to try to pick those items up separately. If you don't want to install a hobby grade receiver, you could just look for any Nikko controller. If they are anything like the Tyco R/C vehicles, there are only a couple different frequencies that are being used, so I think just about any older Nikko controller that you find has a 50/50 chance of working. I did see some Nikko cars more recently that had interchangeable crystals, providing up to 6 different frequencies, so you'll probably want to avoid those ones.